After strong gains yesterday, markets are continuing their builds this morning, propelled by expectations of bullish news from the IEA, OPEC, and the EIA. Crude prices finally took back the $50 support level, closing at $50.92, a gain of $1.37 (2.8%). Prices are holding their ground this morning, at $51.01 at the time of writing. Refined products were pulled higher by crude markets, with diesel prices gaining 1.6% and gasoline gaining 2.3% during the day. Diesel prices this morning are $1.7792, a gain of 1.43 cents since yesterday’s close. Gasoline prices are $1.6062, a gain of 1.47 cents since yesterday. OPEC’s Secretary General was once again in the news yesterday, this time hinting at a meeting between U.S. producers, hedge funds, and OPEC later this year or next year. U.S. anti-trust laws makes it illegal for U.S. producers to collude to raise prices, so any meeting would be very carefully monitored. Last year, OPEC officials met with several U.S. hedge funds to boost confidence in OPEC’s production cuts. It looks like they’re running the same play this year, talking up the market and adding the personal touch of meeting with hedge funds and producers to get everyone on board to boost the market. Numerous market reports will be released today and tomorrow, so get ready for a lot of news in tomorrow’s FUELSNews. The EIA, IEA, and OPEC are releasing monthly market updates this week. OPEC released their update this morning, showing increased production in September, but also showing stronger demand in 2018 led by stronger economic growth in China and Russia. Whether the EIA and IEA concur or not will determine which direction the market takes. The API releases their stock report this afternoon, delayed by Columbus Day. 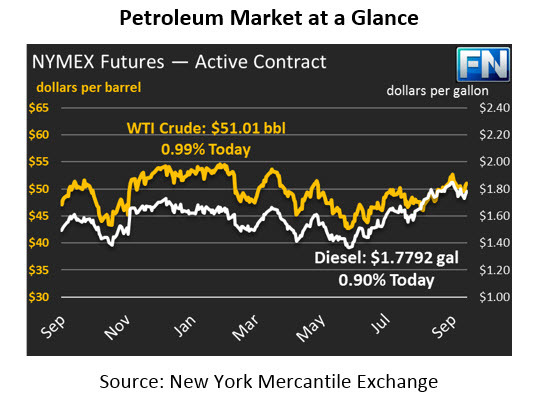 Markets are expecting an across-the-board draw for crude and refined products, which would help send markets higher. Overall, markets are expecting the news this week to be overwhelmingly bullish, so any negative reports from the API, EIA, and IEA could surprise the market and send prices lower.